This snug, boldly handsome all-weather cruiser is ideal for today’s economy-minded families. She was conceived to assure fun, pleasure, and low building and running costs. She is based on a less-costly steel hull, with each living space made as versatile as possible, and without cumbersome features and over-sophisticated technology that savvy owners find unnecessary and expensive. All this is done without sacrificing quality or comfort. On typical three-deck, flying-bridge yachts of this size, guests usually spend most time in the skylounge, reserving the saloon for less frequent formal use and dining. Here the saloon, with up to five sliding doors, can be opened in fine weather as a real skylounge, or closed for cosy gatherings or dining. Forward, separated by the galley, day head, and central stairway, a spacious full-width owners’ suite, with private entrance, offers maximum privacy. Abaft the wheelhouse owners have a combined a flying bridge with an alternate skylounge. Forward it’s wrapped—above and on two sides—by sliding glass panels that can be closed for protection or opened wide to the fresh air. The cruiser has a spacious foredeck to stow tenders and toys, with a crane to handle them. Alternatively one can choose under-cover stowage. The four guest cabins, set midships for easy motion, also have flexibility. 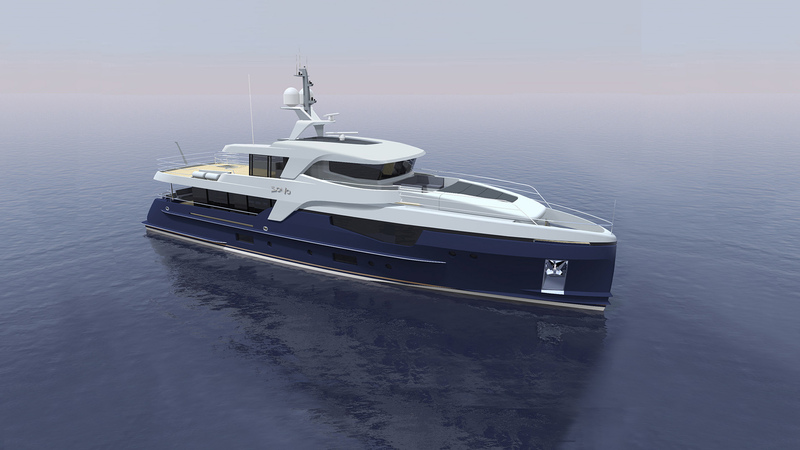 The two cabins forward can be combined into a large VIP suite with sitting room. One after cabin can shift between double or twin-berth arrangement. An efficient crew area is forward.